Tariq Ali on Pakistan’s Nuclear Program, the Hutton Inquiry and the Iraqi Resistance | Democracy Now! In Iraq, at least 45 people have died today in a car bombing destroyed a police station and court house in the town of Iskandariya south of Baghdad today. Earlier another suicide bomber set off a blast outside the home of a U.S.-backed tribal leader in Ramadi. Four bodyguards were wounded. We are joined today by Tariq Ali to talk about the Iraqi resistance and the reaction Britain to the Hutton inquiry. AMY GOODMAN: Greg Palast, thank you very much for beign with us. Tariq Ali, let’s continue on this theme, Pakistan, the connection to the Mujahadin in Afghanistan, and now, the Bush administration and its attitude toward both the Bin Ladens, but also Iraq right now and all, now that you have come from Britain — all that is taking place in the politics of Blair and Bush? TARIQ ALI: Well, let’s see — in terms of what’s going on in Pakistan, I think that the notion that a private individual, the scientist who has invented the nuclear facility, the nuclear bomb, is simply a private individual, doesn’t hold water. There is absolutely no way in which this guy could have operated without the open backing of military intelligence. These are very serious things. Exchanging nuclear know-how with other countries is not something any private individual in any part of world can do or is capable of doing. It just cannot happen. What can happen is that the guy can sell things under the counter, to make money and become a millionaire or multimillionaire, which he probably did, but even those deals I’m absolutely sure military intelligence were aware of them. So the notion that this is somehow a big secret and everyone is surprised… often when you see world leaders, you feel they should be actors. I mean, the way they — the way they sort of dissimulate casually; it happens all the time now. I don’t think that’s a big secret. The question is the following. How do we begin a process of getting rid of these bloody nuclear bombs in a number of countries, Pakistan, Israel, India et cetera. Here I think the West has to set an example. I don’t think anyone believes the Russians or the Americans or the Chinese are going to give them up. Certainly the French and the British could make a start. What do they need nuclear weapons for? Once a start is made, then you can really build the pressure up on Israel and Pakistan and countries saying this is in no one’s interests for anyone to have nuclear weapons. The irony is, Amy, we have a war waged by a president backed by a British Prime Minister on the grounds that this debilitated dictator in Iraq had weapons of mass destruction. Now, we know this was never the case. And it’s obvious the politicians know, but they were prepared to go to war, supposedly on that basis. Yet, there are countries who possess weapons of mass destruction many times over and are completely untouched. I always said if Saddam had had weapons of mass destruction, they wouldn’t have invaded because he might have used them. Obviously. Look at the way they’re treating North Korea. 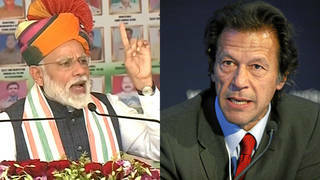 So, this is — it’s a strange situation which we confront now with Pakistan, and it’s part of a broader problem, which honestly, if the Western governments are not going completely crazy, they have to deal with it, it’s a serious problem. Greg is right. There was discussion of a preemptive strike against India at one critical moment in the confrontation between those two countries. If anyone is crazy enough to do that, the whole subcontinent, multimillion subcontinent, could have gone up in smoke. That’s the reality of it. And that’s the — that’s the danger. Now, the question is, the United States historically, as far as Pakistan is concerned, has always preferred to do a deal with the military rather than civilian politicians. Historically, it doesn’t matter who the president here is, doesn’t matter who the commander in chief of the Pakistan army there is. They prefer to deal with the army, because they feel this is the only institution in that country which functions. There is an element of truth in that. We can keep them under control; but the last 20 years, since the Afghan war began against the Russians, they have been totally out of control. The amount of money and weaponry that has gone in, stinger missiles that have been provided to fight the Russians in Afghanistan have been sold on the open market to anyone who wanted to buy them. This has been going on. The fact that this has been transferred to nuclear know-how is chilling, but not totally surprising. AMY GOODMAN: You have just come from Britain. Blair, the prime minister, has called for an investigation into their intelligence. Bush has done the same. Blair wants the information by July. Bush wants it well after election day. TARIQ ALI: Well, the interesting thing is this — Blair, the scientist who was killed, mysteriously committed suicide, which lots of people doubt. I don’t know. Certainly, one of his close friends who works with the United States intelligence agencies knew him in Iraq, has given a long interview saying the man I know could not have committed suicide, not in that way. So, it’s — that mystery has not been solved. The British, whenever they’re confronted with a real scandal and a problem, find a tame judge to carry out a tame inquiry. Historically, they did this on the Falklands war and they did this on bloody Sunday, when Irish Catholics were killed in 1972, the witchery. How could anyone doubt the word of Lord Witchery, we were told. 30 years later, another inquiry into the same events has taken place. We now know that report was a load of nonsense. When Hutton was appointed, the Irish press said this is a safe judge. He has presided over courts without juries, worked closely with the intelligence networks. He was the lawyer for the soldiers in the first Witchery Inquiry in 1972. This guy will be totally safe. The weight of the evidence presented to the Hutton Inquiry, however, was so dramatic that lots of people, including very distinguished liberal journalists, felt there was no way there could be a cover-up, because we had all seen the evidence. Not a bit, this is Britain. There was a total exoneration of the government, total. And this is where he made his mistake. If he had been a bit more even-handed, they might have gotten away with it, but because it was a total exoneration, no one from the government did any wrong at all, the thing has backfired. There’s been a sensational backlash. All of the opinion polls are showing no one believes Hutton; Blair has used the Hutton report to sack two senior people from the BBC, the director general, Greg Dyke, and the chairman of the board of governors, Gavin Davies, who we used to think were too pro Blair anyways, but not pro enough. Now you have an exchange of letters. The director general of the BBC published in the Sunday Times, the largest broadsheet paper in the country, that he was under constant pressure, harassment and intimidation from the government when they decided to go to war. One of the things he said they attacked him for, was how he reported the big anti-war demonstrations. That that day, the Prime Minister’s press secretary called him four times saying why are you saying there are a million people on the streets? He said because there are. How do you know? Have you counted them? This is the Prime Minister’s press secretary ringing the director general for the BBC. Unheard of. So, the whole thing really has exploded in a sensational way, and Blair is, at the moment, not trusted at all. The new inquiry he had to do because Bush had done it here. So, how could he not. But the guy who has been Appointed to carry this out is a tame civil servant called Butler and everyone is joking: we know what the butler didn’t see. AMY GOODMAN: Tariq Ali, on the issue of the top sacked BBC heads, they — one of them was, I believe it was Gavin Davies, had criticized the U.S. press, saying how horrified he was by how beholden the U.S. press was or how pro-war they were when it came to covering the invasion. TARIQ ALI: No. This is true. I think the war really brought out the best in the old English Liberal establishment. There’s no denying it. You had two leading newspapers The Guardian and the Independent, which were opposed to the war. You had a leading tabloid, The Daily mirror, which was completely opposed to the war, and you had the BBC, which was more even-handed than one had expected. Let’s put it like that. If you watched the BBC and compared it to CNN or the U.S. networks, you were living in a different universe. Blair couldn’t handle it. He comes to the United States and sees what an easy press Bush gets. He goes to Russia and sees how Putin is uncriticized. He goes to Italy where Burlesconi owns the whole thing. He comes back and here he is being attacked by the BBC. Critics of the BBC are allowed on. I was on key programs, “Question Time” before the war, arguing the case against the war. The fear is — and they insisted that the director general and the chairman could stay if they made a groveling apology, after the Hutton Report. To their credit, both men refused to apologize, and then we had this amazing sight on the British television screens: two guys in gray suits, you know looking like zombies from Germany, suddenly walk on and say, we apologize, we were extremely wrong, we know we were wrong on everything, we apologize completely. The journalists in the BBC are up in arms. There have been demonstrations, journalists walking out onto the streets. The question is whether Blair can implement this or not. The irony for him is that he might have been luckier if they told Hutton to be more even-handed. Because now people want to punish him electorally. I think that’s the trap he has led himself into. AMY GOODMAN: Today alone, 45 people were killed in Iraq. Can you talk about what you call the re-colonization of Iraq? TARIQ ALI: It’s not working. That’s the thing. They were thinking it would be, after six or eight months, they could keep everything down. Then as we discussed on your program many a time, Amy, they had this absurd view, which we challenged, that all that was needed was to capture Saddam Hussein and all would be well. Like people say, if you capture Osama, that’s it. We know that’s not it. There are networks. The capture of Saddam, giving him prisoner of war status, talking to him. Evidently, he’s helping out, according to some reports from Iraq. He is telling them, this is how you should deal with the resistance. These guys, these jokers who you have gotten on the National Council couldn’t run a coffee shop, let alone a country. I’m the only one who can. I am told that U.S. generals are talking to him regularly. Now, at the same time the situation on the ground is getting worse and worse and worse. Who would have thought — I mean we did, but most people who went along with it, assumed okay, we didn’t want the war. It was a bad thing, but now it’s there. You know, it will calm down, but it isn’t calming down. It really isn’t calming down, and you have a two-pronged Resistance now. You had the armed Resistance, according to the CIA, and the Pentagon reports, between 10,000 and 15,000 armed guerrillas which is a hell of a lot, actually. It’s not a small army. The second thing that you have is the Shiites coming out more and more. Big mass demonstrations in the Southern cities. Even Sistani, who is close to the British, incidentally, demanding an elected constituent Assembly. You have now another problem confronting the United States. You might — they might be forced to go down that route and then it is what Huntington has called the Democratic paradox, which is, if you allow the government to be elected people who you have been arming and funding for the last 20 years, the religious groups and the first thing they do, is put in laws which take away rights from women, which they enjoyed under Saddam Hussein. The whole wretched business is unraveling at a very rapid rate. GREG PALAST: Yeah. The question is really, why are we still there? And as we know, we have had Paul O’Neill, the former Secretary of the Treasury saying that right after Bush got inaugurated there were sit-down sessions with oil companies talking about dividing up Iraq into oil concessions, way before the invasion. I have obtained a document, and so has the Wall Street Journal with basically what is the secret plan of the U.S. State Department to reorganize the economy of Iraq. What it really means is selling off every asset that nation has, including, and it says right in the document, the oil concessions and oil services and pipelines of that nation. It’s a 270-day plan. Obviously, it’s getting a little stuck in the mud, but if they can push it through, we will see our troops out, but you have to remember that at that point, Iraq will have been stripped of its assets. It’s not a question of whether the war was correct or not going in or whether we should have gone in or not. It’s important to investigate, but no one seems to be asking the simple question, why are we still there. After all, Saddam is in the Hoosegout. We were there for democracy? Where is the democracy and the elections? There won’t be elections until after all the assets are gone. No Iraqi elected government, of whatever stripe or religious character would ever agree to sell off the nation’s major assets, including the oil fields. Our troops are there to prevent an election until basically the cupboard has been stripped bare. That’s — the internal documents that we have; and I’m very disappointed in my colleagues in the U.S. press, not only on the Khan story, but this story. We had John O’Neill come forward. Good work by the Wall Street Journal, but he’s talking about meetings and documents. Where are the meetings? What about the rest of the documents? AMY GOODMAN: You mean Paul O’Neill. GREG PALAST: Excuse me. Paul O’Neill. To note something, at some of those National Security meetings, those discussions that horrified Paul O’Neill, the Treasury Secretary, about dividing up Iraq there was a journalist named Bob Woodward of the Washington Post who spent his time watching George Bush to write this biography, “Bush at war.” And of course to have that journalist at these meeting meant they were no longer private National Security meetings. Paul O’Neill walks out saying: I’m horrified; we’re planning a war to grab assets, and we don’t get any of this from Bob Woodward in those meetings from the Washington Post. TARIQ ALI: To add to what Greg said, it’s not just the oil. That’s bad enough. And on that, there is no doubt, not a single Iraqi party of whatever stripe would agree for the oil to be taken away from Iraqi interests. If they do it, they will have more trouble, within two, three, four year’s time. This is something which goes very deep in the whole of Iraqi society. It’s our oil. It may have been misused, but it belongs to us. We took it back from the British and we’re not going to hand it over to you. But added to the oil, we now have private companies who specialize in privatizing health facilities in Britain and the United States. They’re going in to privatize Iraq’s health service. This used to be — before the sanctions, this used to be — everyone says they had the best health service in the Middle East. Large number of women and male doctors, treatment free for poor people. If this is being privatized in a country like Iraq, it’s — I Mean, I just — the mind boggles. Where is it going to end? AMY GOODMAN: Top story on the radio Yesterday, throughout the day: They said there may yet be proven a connection with al Qaeda. This is saying Jordanian suspected of ties to al Qaeda. 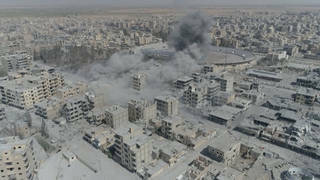 Abu Zarkawi is likely to have played a role in three major car bombing attacks in Iraq that have killed 100 people in the last six months, senior American official said. The New York Times goes on to say that the intelligence information has provided mounting evidence to suggest that Mr. Zarkawi was involved in the bombings including the August attacks on a mosque and the United Nations head quarters Baghdad and the November attack on the Italian police headquarters. One official cautioned that the evidence stopped short of firm proof of involvement by Zarkawi, but said the intelligence had added significantly to concerns about Mr. Zarkawi. GREG PALAST: Amy this cannot be true because our president has told us we’re safer now since the invasion of Iraq. What we have to understand is that our president said, I actually just looked at his speech from last march 17. He said we’re going into Iraq to get those who have aided, harbored and trained terrorists, including those associated with al Qaeda. That’s, quote, from our President, and he didn’t find any people connected to al Qaeda that were there with Saddam Hussein’s support. But now that we are there — now it’s like it’s a welcome mat for al Qaeda now. So, the question is, is our President correct? Is he correct that we are safer? Yeah. He’s right. There may well be al Qaeda in Iraq, but they didn’t come until after our tanks arrived. TARIQ ALI: This is the key point, actually, that Saddam Hussein, for all of his horrors, and we know them well, was totally hostile to religious fundamentalism. He kept al Qaeda out of Iraq. There was no proof and this has been admitted by Colin Powell, by Blair, by the intelligence network. There was no connection with al Qaeda prior to the war in Iraq. Now, if you have Iraq, Arab Country, occupied not just by the United States, but Britain and Italians, by Ukrainians and Poles and Bulgarians, I mean, you know the whole circus is there, how can you stop Arabs of whatever nationality or political stripes. They’re going in there. We’re going in there to take them on. That’s illogical. I wouldn’t be surprised if there are a few al Qaeda people in there. It’s not just them. There are kids from all over the Arab countries saying we want to go to Iraq and fight against the occupier. That’s the reality. AMY GOODMAN: What do you think needs to happen now, Tariq Ali? TARIQ ALI: I think the sooner they get out, the better. The sooner they realize this is a mistake, we shouldn’t have done it, actually, people would respect them for that, saying, okay, you have lost, you know, hundreds of your own soldiers, 3,000 American soldiers have been badly wounded, which no one talks about, 10,000 Iraqis have been killed, probably several thousand civilians have been killed. It’s bad, but it’s still time to pull out. Set up, you know, the national government will form itself consisting of all of these groups. They’ll organize their elections but the West should just pull out of there, not try to take Iraq’s oil, not try to privatize the country. If they do that, the bitterness they will leave behind in the country will be with us for a long, long time to come. An Iraq that is occupied or and Iraq whose oil is stolen will never be at peace. AMY GOODMAN: The role of the U.N.? TARIQ ALI: The U.N. hasn’t played a role so far. That’s the fact of the matter. If they want to enable the United States to withdraw, let them do it. I’m not opposed to that. I don’t trust them, because after all, one shouldn’t fetishize what the U.N. is. It has never done anything since the cold war without the U.S. bidding. If the U.S. wants to use them to pull out, do what has to be done, but get the troops out of Iraq. Look, we know it’s election year in the United States. Don’t think that the Iraqi Resistance is unaware of this fact. They know perfectly well it’s election year. They will in my opinion try to score a few big hits like trying to blow up barracks. Why should the lives of ordinary American soldiers be lost to appease the vanity and mistakes of these politicians. It’s not even the intelligence services at fault. It’s the politicians who push the intelligence services in the United States and in Britain to give them the intelligence they needed to try to convince the skeptical public that they have to go to war and the lives that are being lost, the Iraqi lives and American lives, are being lost for no rhyme or reason.